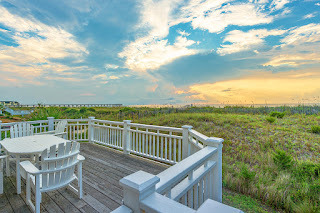 We recently reduced the asking price on this oceanfront stunner on Wrightsville Beach to $2,750,000. Located at 18 E Asheville Street (right next door to the iconic De Laurentiis mansion), this custom-built luxury estate exemplifies the Carolina waterfront style. 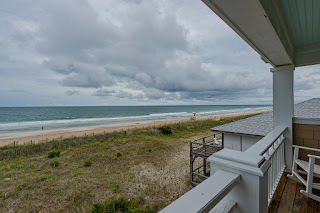 From the moment you enter the great room on the main level of this three-story, 3783 square foot beauty, you’ll be blown away by the non-stop views of Wrightsville's famous white sandy beach and crystal blue water. 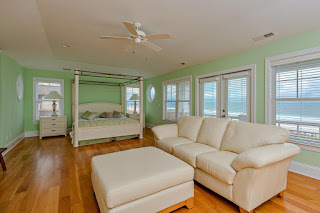 The soft Carolina pallet of seafoam green and wide open floor plan immediately lightens your mood. 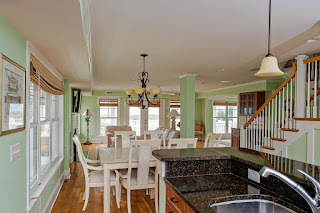 The chef's kitchen has an expansive granite covered island bar perfect for entertaining guests. 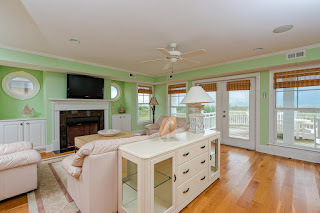 After dinner, grab your coffee and move the conversation to the separate sitting room just adjacent to the enormous oceanfront deck and watch the sunset over the Atlantic. Beautiful white crown moulding, wide door and window trim, and plantation blinds continue the craftsman detail throughout the home. The remarkable penthouse master suite has even more details, including a tray ceiling, more portholes, never-ending windows, and French doors leading to a private balcony. The luxurious en suite features a custom tiled walk-in shower, garden tub with tile surround, and a double vanity. You’ll never want to leave the penthouse! Three of the five guest quarters enjoy private baths as well. 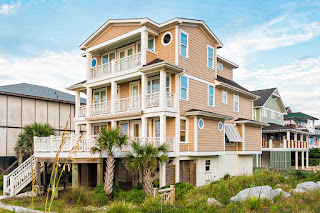 The exterior won’t disappoint either with its native plants and shrubs like palm trees and sea oats, and a boardwalk-inspired sidewalk, all of which can be enjoyed from the three levels of covered and uncovered decks and balconies. Oh, those decks! This is one amazing home, but you might just find yourself spending more time outside on the decks than in watching the sun rise and set and watching the waves roll in and out. For more information, photos and more, click here. Or to schedule a private tour of 18 E Asheville Street, contact Hardee Hunt and Williams at 910-256-6998.